Sample Logic: Sample Logic Releases the New TryPack! Sample Logic Releases the New TryPack! How would you like to check out the wide world of Sample Logic before you take the plunge and slap down your hard-earned cash? Now you can, with the $5 TryPack Kontakt sample library! TryPack delivers 750+ MB, and celebrates a small selection of over 5 years of "blurring the line between music & sound design." 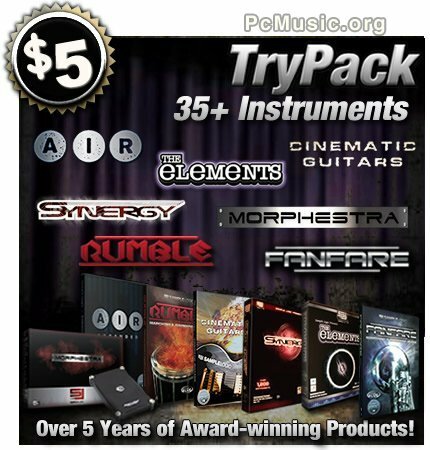 The TryPack collection contains 5 Kontakt instruments from each of our award-winning libraries. Even if you already own any of these titles, at $5, TryPack is still the best opportunity for sampling all of our logic. After sampling a small taste of each product, pick up the ones you like from our website.